Learn how to repair windshields with our free course on Windshield Repair. Know which Windshield Repair Kits are available and which kits fit your repair needs. Be informed by seeing a comparison of the kits and processes before you begin, and be able to determine whether a windshield can be repaired or needs to be replaced. These kits are used to repair bullseye, spider web, star, chip, and combination windshield damage. Some kits can repair cracks. See kit comparison chart for specifics. The following is a list of components that are included with kits if this type. The kits include some or all of these components, and some have variations of these components. Each component is listed by its most common name followed by an explination of its usage. 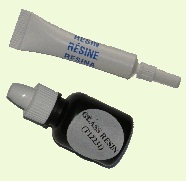 The Resin Container contains a low viscosity UV activated polymer resin. The resin's curing process is activated by exposure to UV light from the sun or UV lamp. 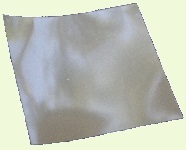 Mylar curing strips are used to hold the resin in place. Due to the capillary action between the windshield and the curing strip, resin will lay very flat and evenly distributed under the strip during the curing operations. This prevents there being a bulge or lump of resin at the base of the repair and an indention over the chip cavity. It also ensures the resin cures in a thin layer on the glass surface which can easily be scraped off the surrounding glass and smooth to the surface of the glass around the chipped area. The Safety Razor's primary functions are to act as a squeegee to push air bubbles out from under curing strips, and as a scraper to remove cured resin from the surface of the windshield around the damaged area. You will find that a safety razor holder like this one is a big help when using the safety razor for scraping operations. 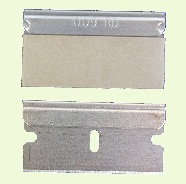 It also allows the blade to be retracted for safety when not in use and makes the blade much easier to keep up with.